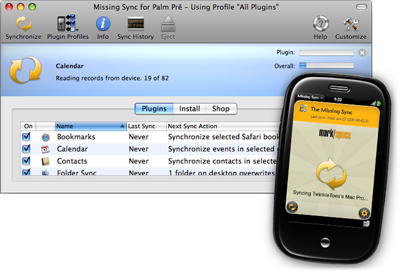 There are several apps available for webOS that create third-party Synergy accounts, chief among them desktop syncing solutions PocketMirror and Echo from Chapura and The Missing Sync from Mark/Space. It’s all great stuff, and it works quite well with the intended-for-the-cloud Synergy system used by Palm. That is, it works well until you move to webOS 2.X and try to delete the app and it corrupts your phone in the most unimaginable ways possible. It’s a bug that the folks at Chapura discovered in webOS 2.0, and we have no indication that it’s been fixed in webOS 2.0.1 or 2.1: if you delete a third-party app that brought its own Synergy plug-in without first removing it from the Accounts app, you’ll be left with a phone a state that Chapura says can only be fixed by performing a full erase. In short, it’s not good, and we hope this oversight gets fixed in the next update to webOS. In the meantime, there’s an easy workaround: remove the Synergy account, then the app. It goes as such: Close the relevant apps to be removed and launch Accounts. Select the appropriate Synergy account for the app to be deleted (e.g. Outlook for PocketMirror). Tap on Remove Account and confirm. Repeat for any other associated Synergy accounts (don’t touch any of your cloud Synergy accounts like Google or Yahoo, as they’re safe). And that’s it. Synergy followed by apps. After you’ve removed the Synergy accounts and apps, you can reinstall them if necessary, though the same steps will have to be followed should you ever need to delete the apps in the future (assuming a webOS update hasn’t corrected this bug).